Magnesium is an abundant mineral in the body and is found naturally in many foods, like green leafy vegetables. It is also found in over-the-counter medications, such as laxatives. The average American intake of magnesium is critically low, according to the National Health and Nutrition Examination Survey (NHANES Study): Many Americans fail to consume the estimated average requirement (EAR) established by the Institute of Medicine. In addition, more than 57% of the population does not meet the United States Department of Agriculture requirements for magnesium in the diet. 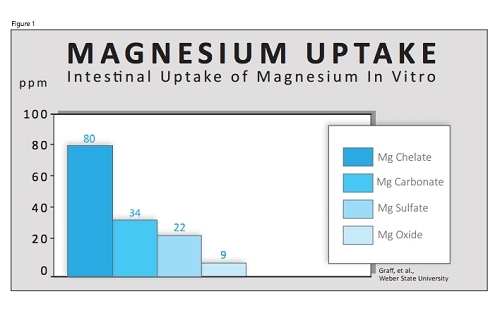 Intracellular magnesium levels are decreased by excessive intake of alcohol, salt, coffee, phosphoric acid found in sodas, diets high in calcium and high stress levels. Because of widespread nature of magnesium deficiencies, adequate daily intake of magnesium is critical for proper hydration, stress response, muscle relaxation, promoting healthy blood pressure levels, optimal bone mineral density, and blood sugar regulation. 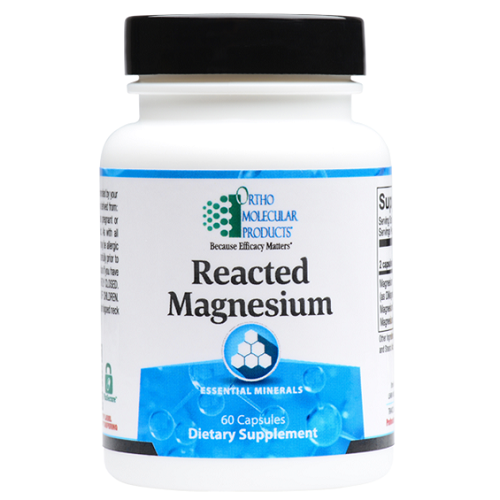 Reacted Magnesium provides three unique forms of highly-absorbed magnesium to ensure maximum absorption of this important macromineral. Most magnesium supplements use only a single source of magnesium, which can easily overwhelm a single pathway of absorption and limit uptake. 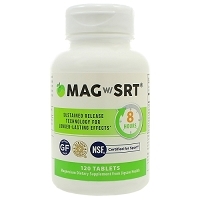 Reacted Magnesium takes advantage of three unique pathways of absorption by providing magnesium as di-magnesium malate, magnesium citrate and magnesium glycinate for enhanced absorption, improved utilization and gastrointestinal (GI) comfort. 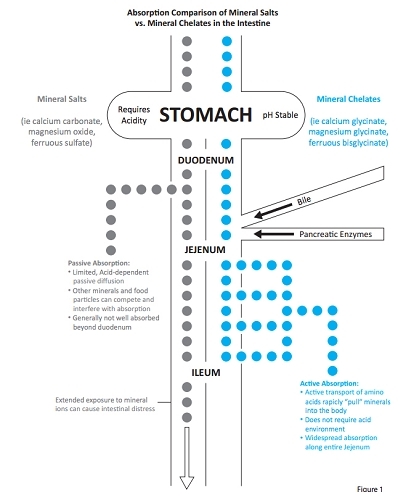 Some individuals, who take other forms of magnesium supplements, often experience GI side effects, including gas, bloating, diarrhea, constipation or a combination of these symptoms. 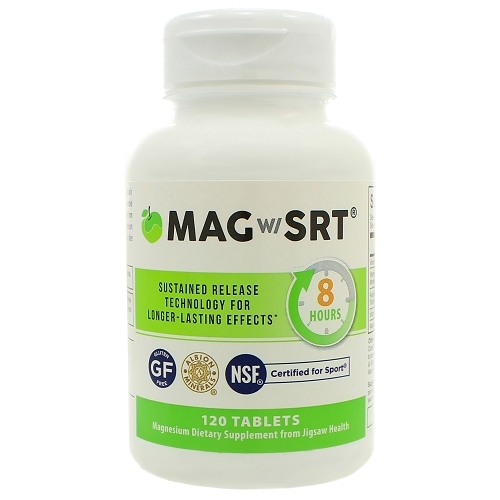 The forms of magnesium used in Reacted Magnesium preserve GI comfort while maximizing absorption and restoring magnesium levels in the body. Other Ingredients: Natural vegetable capsules. This product may contain one or more of the following: calcium silicate, magnesium stearate, microcrystalline cellulose, silicon dioxide, and stearic acid. 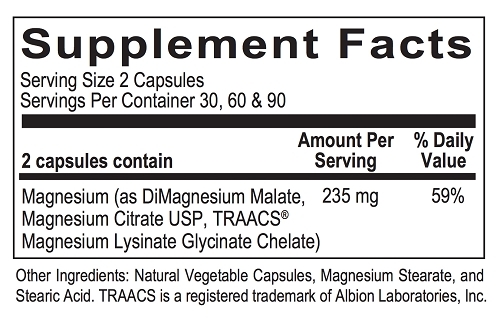 TRAACS is a registered trademark of Albion Laboratories, Inc.
Studies to date have found that magnesium supplementation maintains healthy blood pressure levels. Calcium is essential to the contraction of muscles, while magnesium aids muscle relaxation. Insufficient magnesium levels can contribute to constriction of the muscles in blood vessels and trigger changes in blood pressure levels. Magnesium is integral for the transport of insulin from the bloodstream to cells. Increasing magnesium levels has been shown to maintain normal blood sugar levels. Diets with higher amounts of magnesium are associated with blood sugar balance, due to the role of magnesium in glucose metabolism. [13-15] Most investigations of magnesium intake and insulin balance have been prospective cohort studies. A meta-analysis of seven of these studies, which included 286,668 patients, found that a 100 mg/day increase in total magnesium intake promoted insulin balance by a statistically significant 15%. Another meta-analysis of eight prospective cohort studies that followed 271,869 men and women for an extended period of time found a significant association between magnesium intake from food and insulin balance.